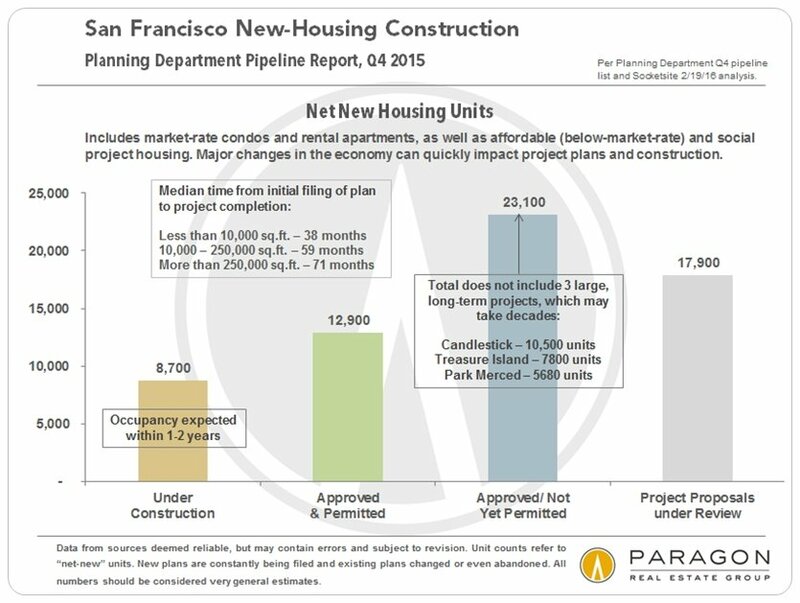 The SF Planning Department just released updated Q4 2015 information regarding the new-housing development pipeline. 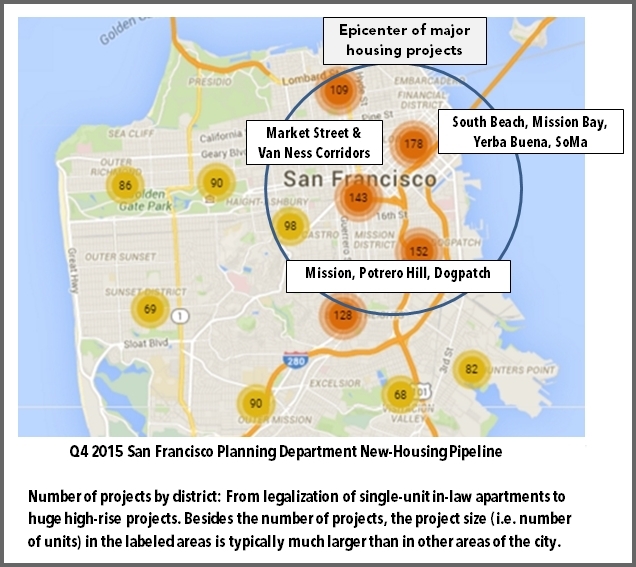 San Francisco is in the midst of one of its biggest new-housing construction booms in history. 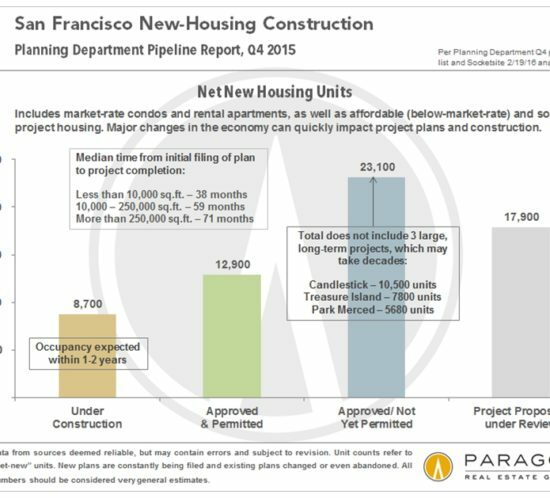 (The same is occurring on the commercial development side, but this report won’t deal with that.) Indeed, it often seems that new projects of one kind or another are being announced on an almost daily basis, and a detailed map delineating all projects in some stage of the pipeline makes many city districts appear to have measles. 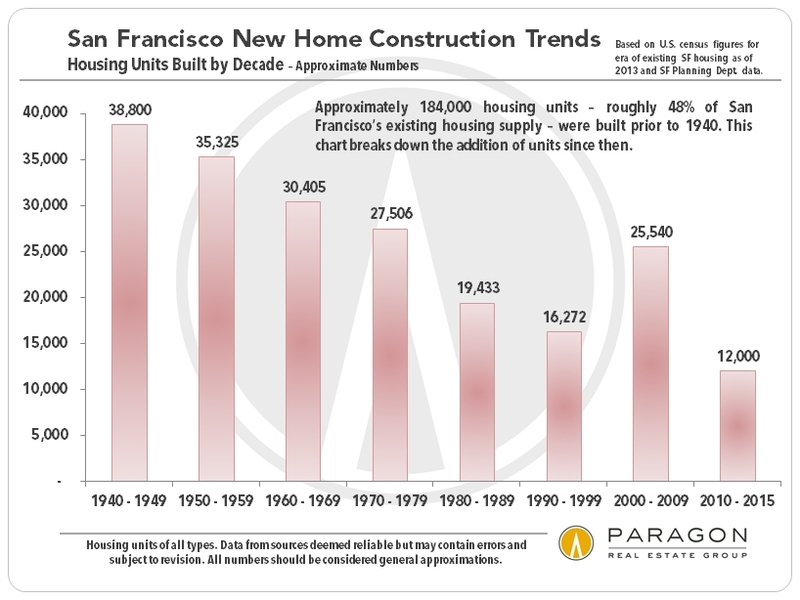 Housing supply and affordability issues, strong feelings about neighborhood gentrification and tenants’ rights, and even simple NIMBYism (or in SF, NBMVism, “not blocking my view!”) make development the most contentious political topic in San Francisco. Furious battles are ongoing in the Board of Supervisors, the Mayor’s office and the Planning Department; with neighborhood associations and special interest groups; and at the ballot box. Development is not for the faint of heart or shallow of pocket: One cannot contemplate building virtually anything in the city without vehement opposition and sometimes a well-funded coalition in opposition. For developers, the equation to be calculated out includes very high land and construction costs, increasing affordable-housing contributions required by the city, enormous hassle-factor and extended project timelines on one side, and the potential for financial returns on the other. 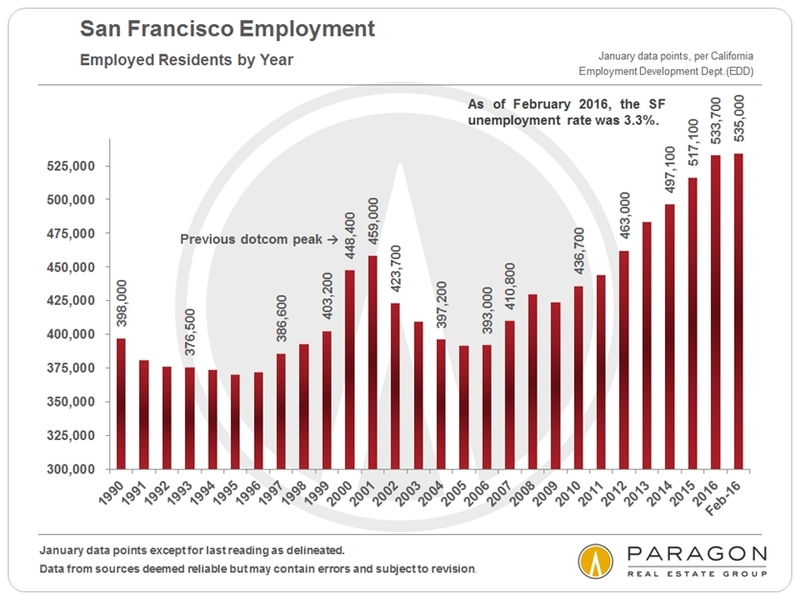 In new San Francisco developments, condos often sell for $1250 per square foot and above, but we are hearing from people on the development side that they can no longer pencil out building new housing in the city in a way that makes financial sense. They believe that many of the projects in the pipeline probably will not actually be built, and thus the numbers quoted above are greatly overstated. 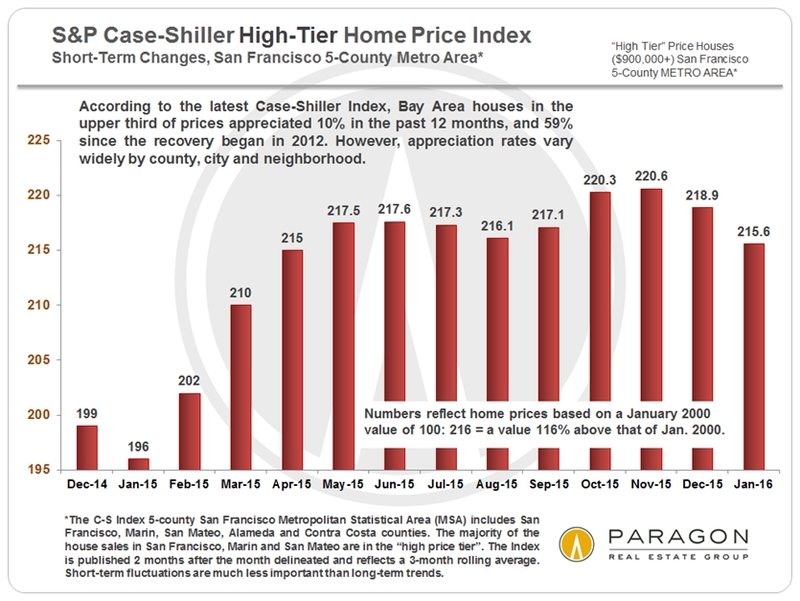 The S&P Case-Shiller Index for the San Francisco Metro Area covers the house markets of 5 Bay Area counties, divided into 3 price tiers, each constituting one third of unit sales. 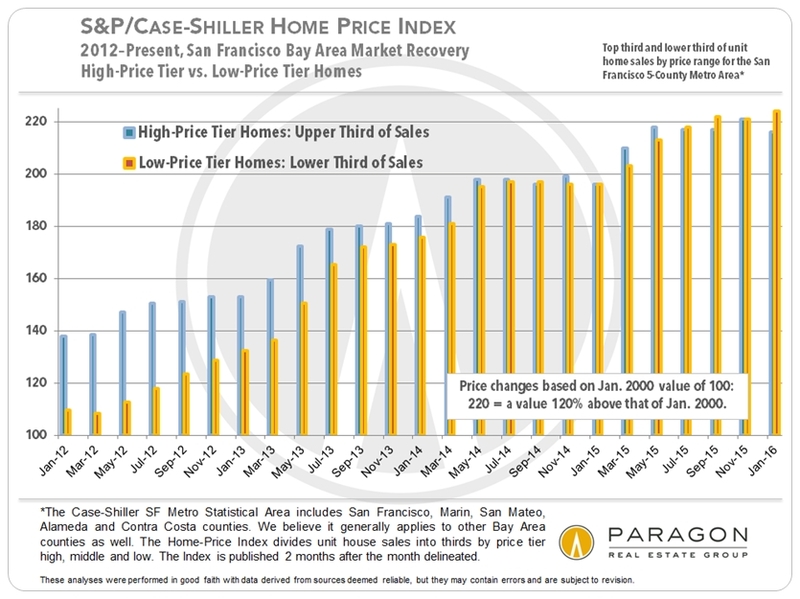 Most of San Francisco’s, Marin’s and Central Contra Costa’s house sales are in the “high price tier”, so that is where we focus most of our attention.” The Index is published 2 months after the month in question and reflects a 3-month rolling average, so it will always reflect the market of some months ago. The Index for January 2016 was released on the last Tuesday of March 2016. 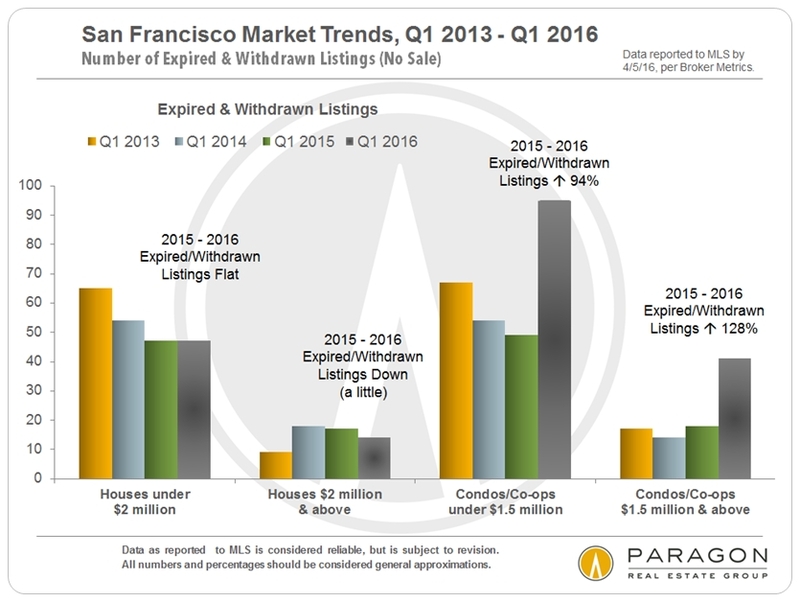 It mostly reflects the market in late 2015. 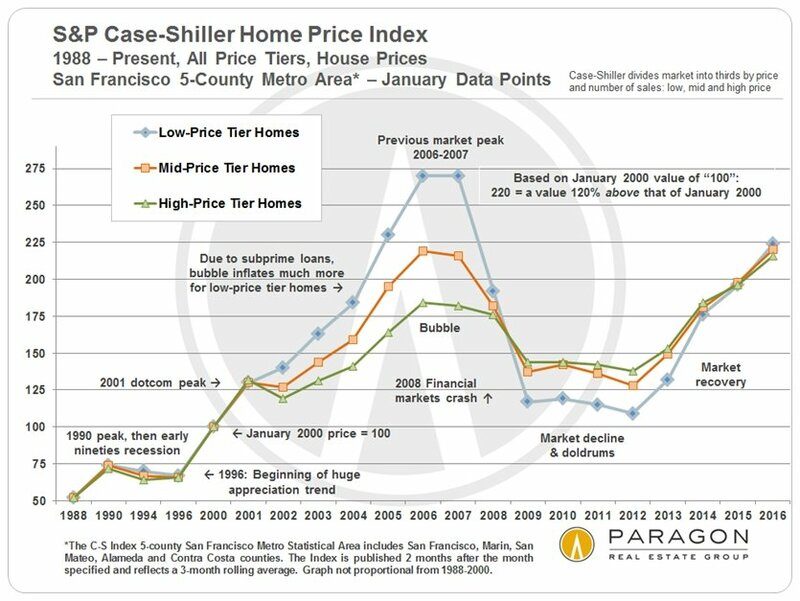 The 5 counties in our Case-Shiller Metro Statistical Area are San Francisco, Marin, San Mateo, Alameda and Contra Costa. 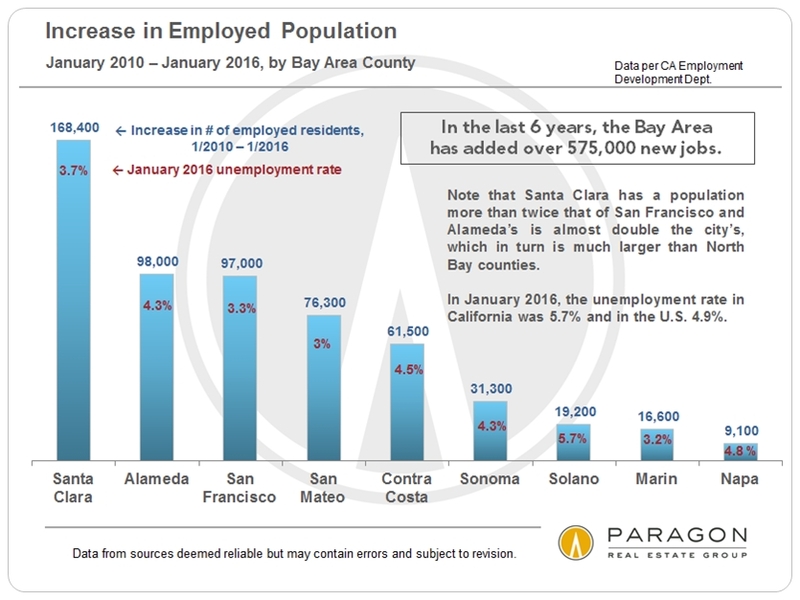 (And we believe the Index generally applies to the other Bay Area counties as well.) 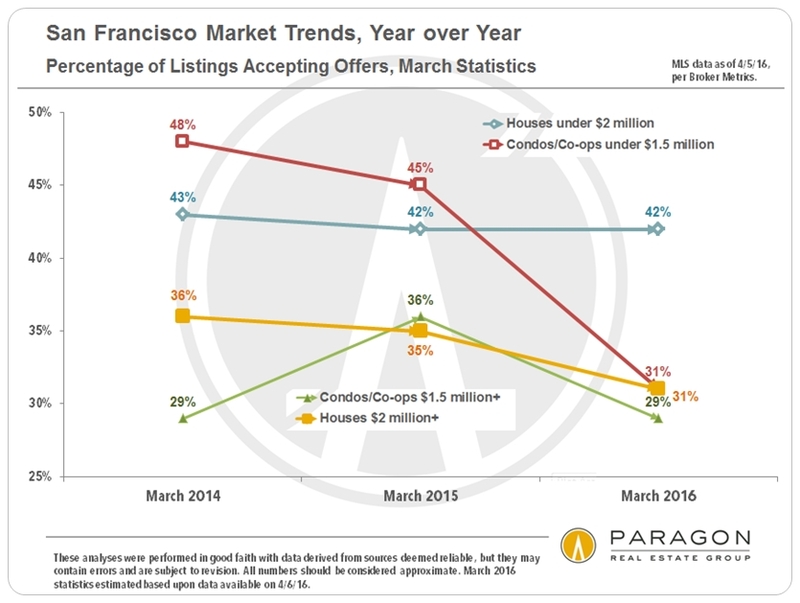 There are many different real estate markets found in such a broad region, and it’s fair to say that the city of San Francisco’s market has generally out-performed the greater metro-area market. 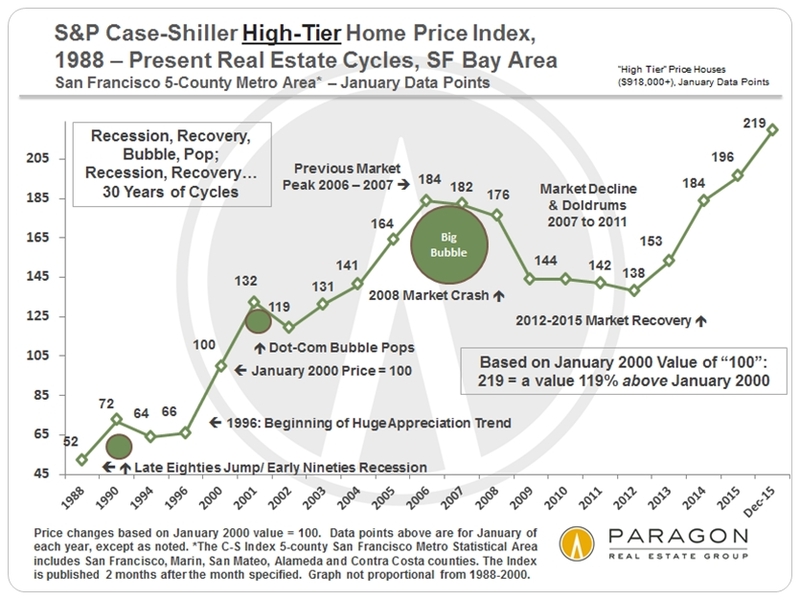 These 5 charts below illustrate the price recovery of the Bay Area high-price-tier home market over the past year and since 2012 began, when the market recovery really started in earnest. 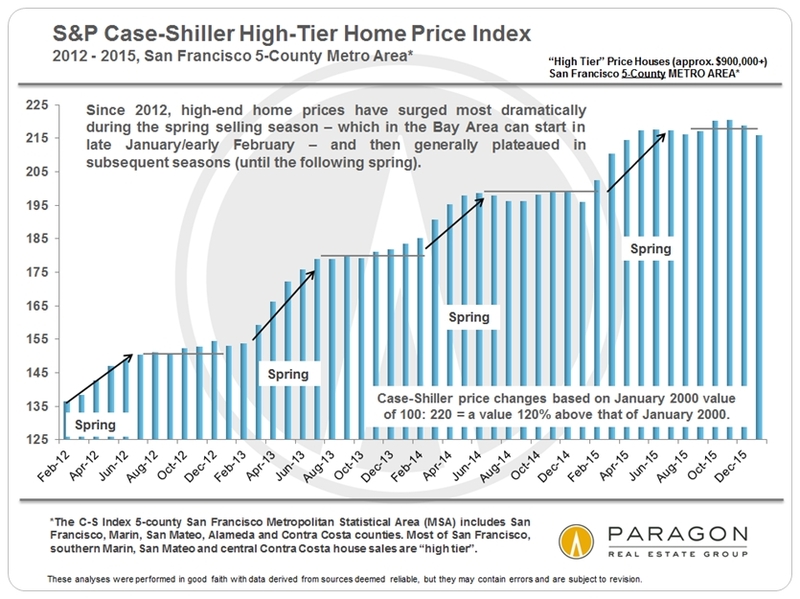 In 2012 – 2015, home prices dramatically surged in the spring (often then plateauing or even ticking down a little in the following seasons). 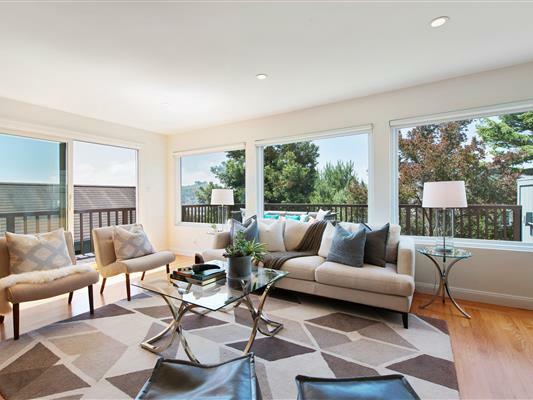 The surges in prices that have occurred in the spring selling seasons reflect frenzied markets of high buyer demand, low interest rates and extremely low inventory. 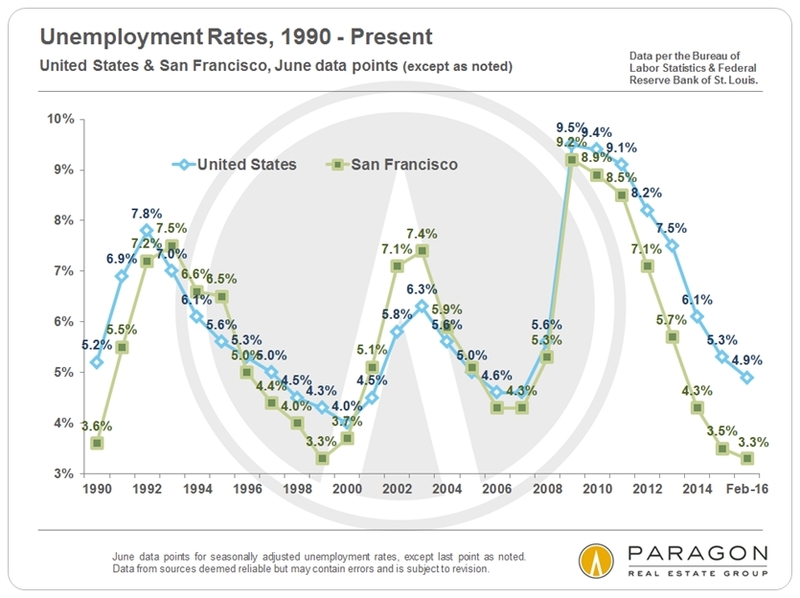 In San Francisco itself, it was further exacerbated by a rapidly expanding population and the high-tech-fueled explosion of new, highly-paid employment and new wealth creation. 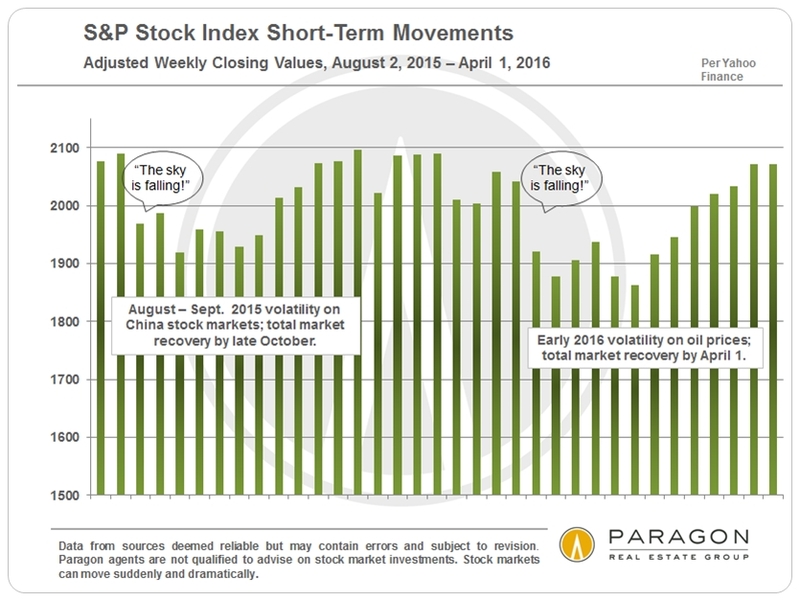 International and national financial markets volatility rose and fell in early autumn 2015 and again in early 2016. 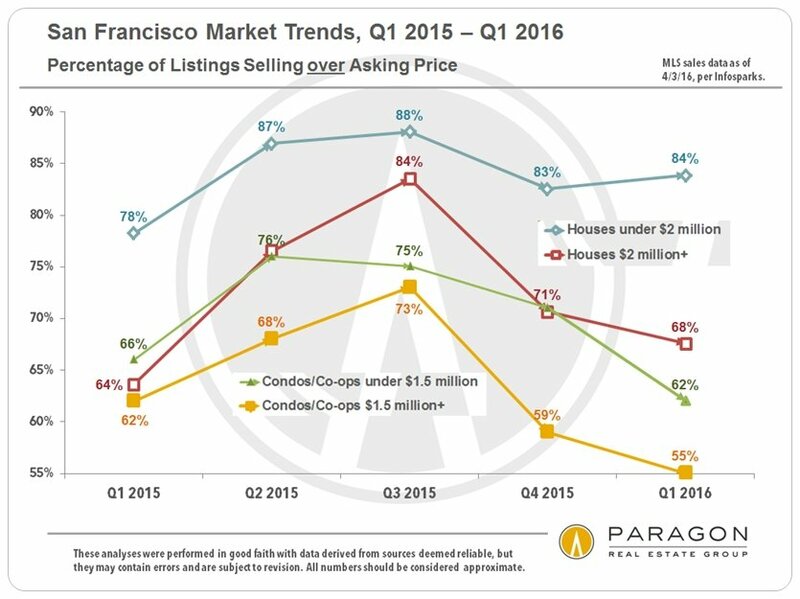 At this point, we are waiting for the data from new spring selling season to start arriving, which will occur over the next few months. Then we will start getting an idea of where the market is heading in 2016. 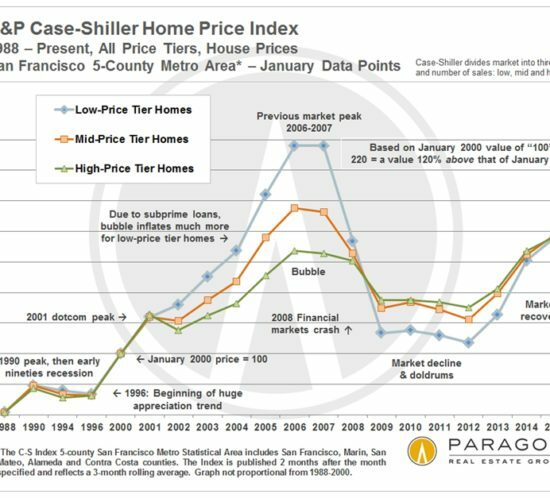 Case-Shiller Index numbers all reflect home prices as compared to the home price of January 2000, which has been designated with a value of 100. 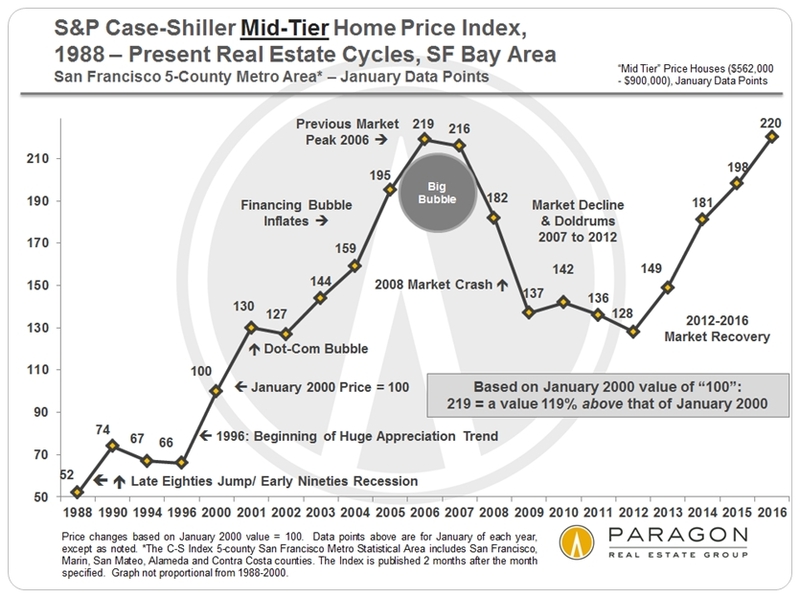 Thus, a reading of 220 signifies home prices 120% above the price of January 2000. 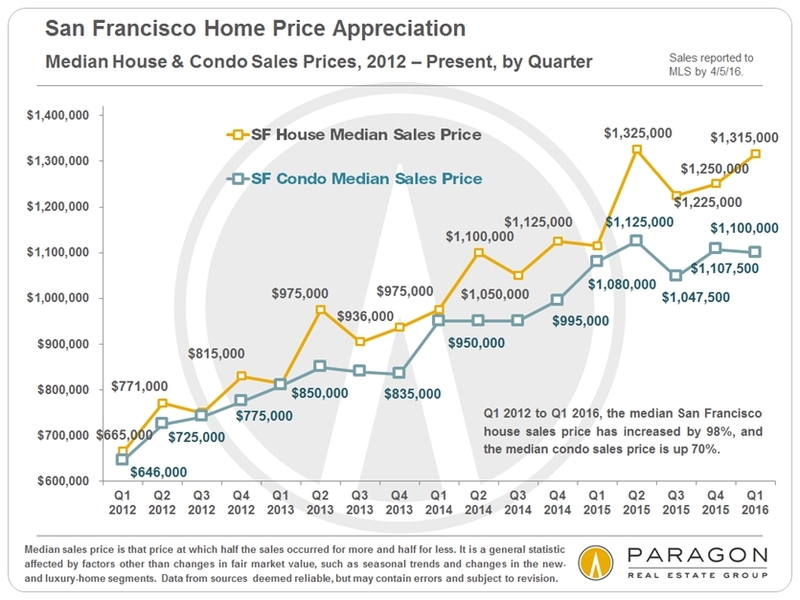 This chart below highlights the highly seasonal nature of home price appreciation over the past 4 years. 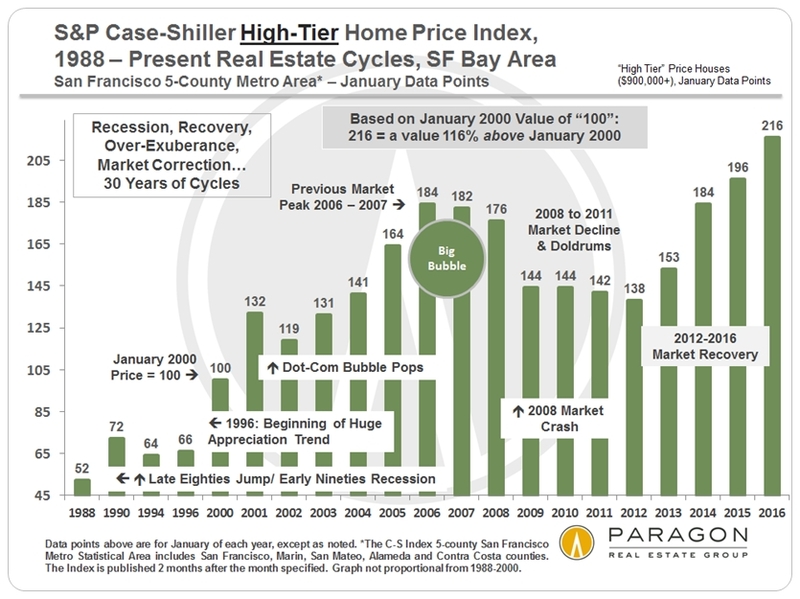 The first two charts below reflect what has occurred in the longer term (for the high-price tier that applies best to San Francisco, Marin, San Mateo and the most affluent portions of other counties), showing the cycle of recession, recovery, bubble, decline/recession since 1996, and since 1988. 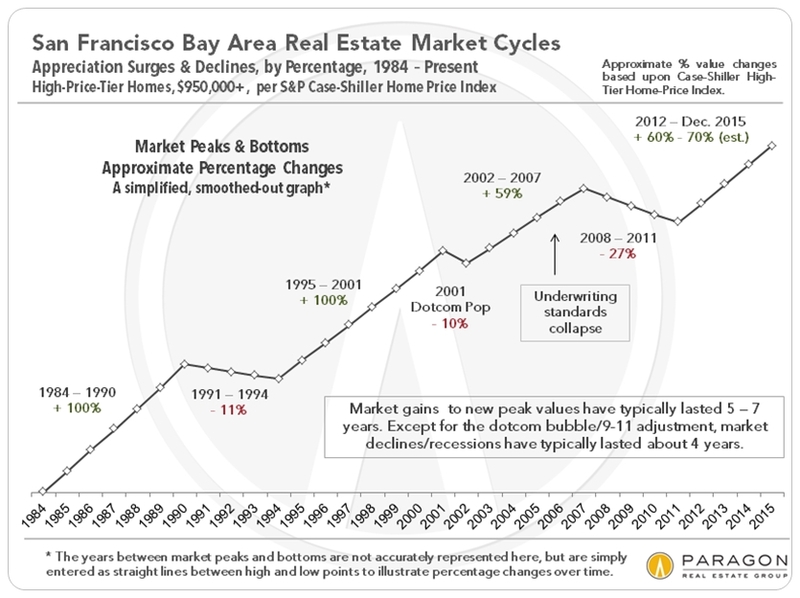 Note that, past cycle changes will always look smaller than more recent cycles because the prices are so much higher now; if the chart reflected only percentage changes between points, the difference in the scale of cycles would not look so dramatic (as seen in the third chart below). This next 3 charts compare the 3 different price tiers since 1988. 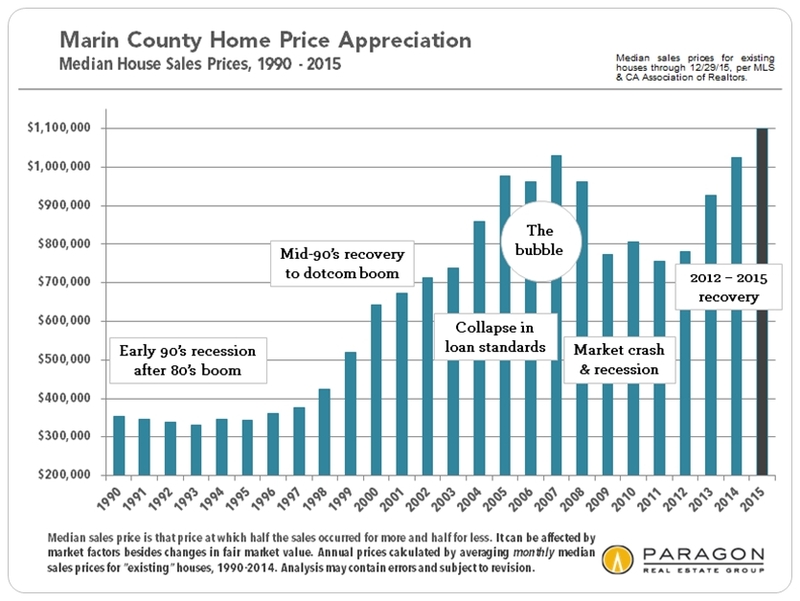 The low-price-tier’s bubble was much more inflated, fantastically inflated, by the subprime lending fiasco – an absurd 170% appreciation over 6 years – which led to a much greater crash (foreclosure/distressed property crisis) than the other two price tiers. All 3 tiers have been undergoing dramatic recoveries. 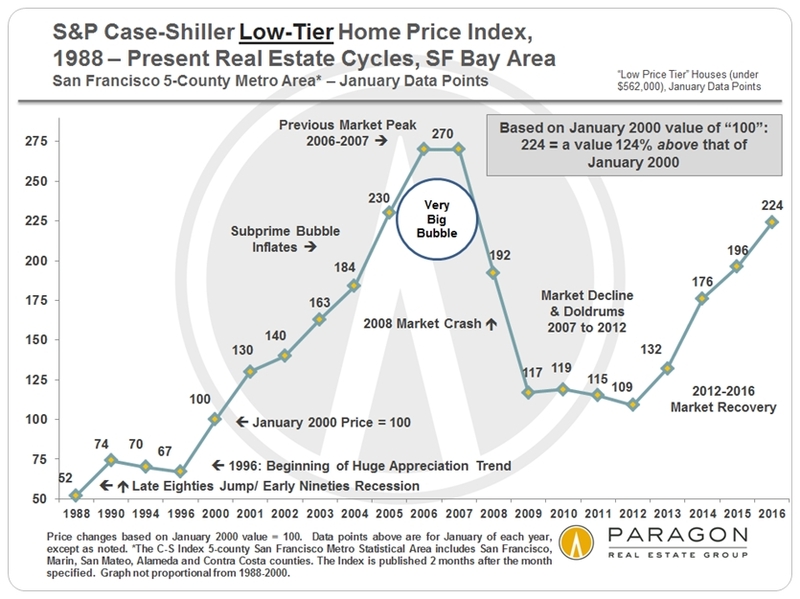 The mid-price-tier is just now back to its previous peak values, but the low-price-tier is still well below its artificially inflated peak value of 2006. 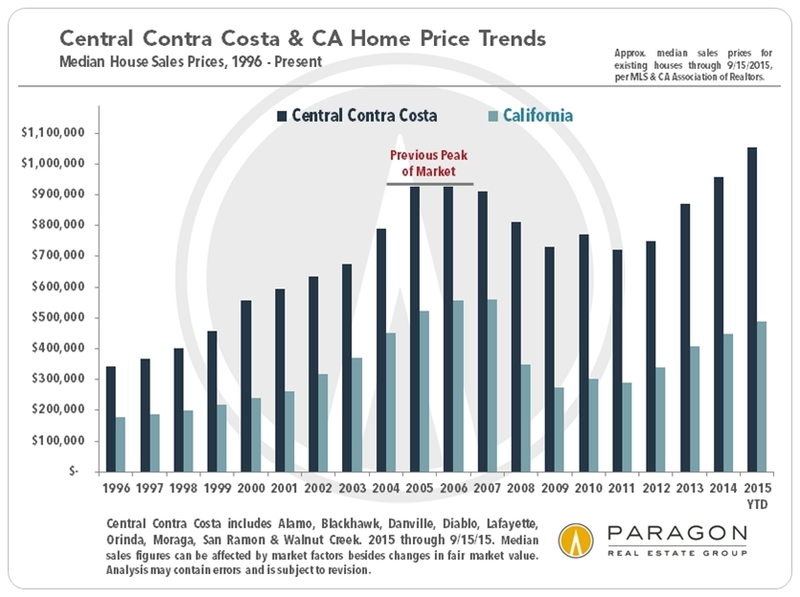 It may be a long time before the low-price-tier of houses regains its previous peak. 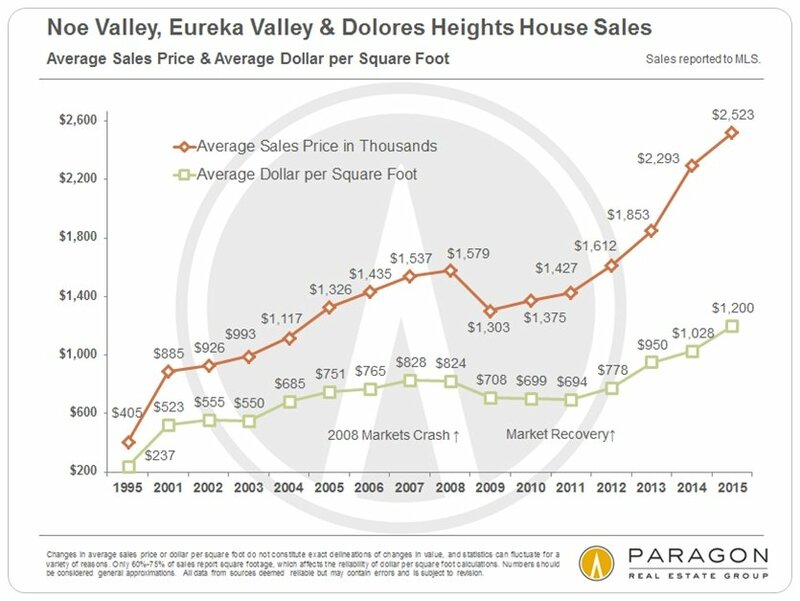 The high-price-tier, with a much smaller bubble, and little affected by distressed property sales, has now significantly exceeded its previous peak values of 2007. 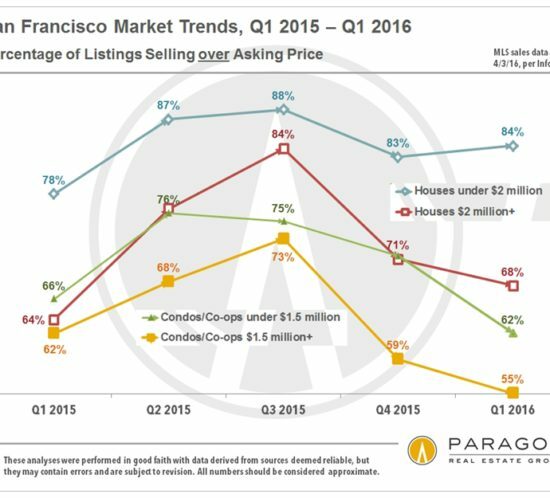 Most neighborhoods in the city of San Francisco itself have now surpassed previous peak values by very substantial margins. 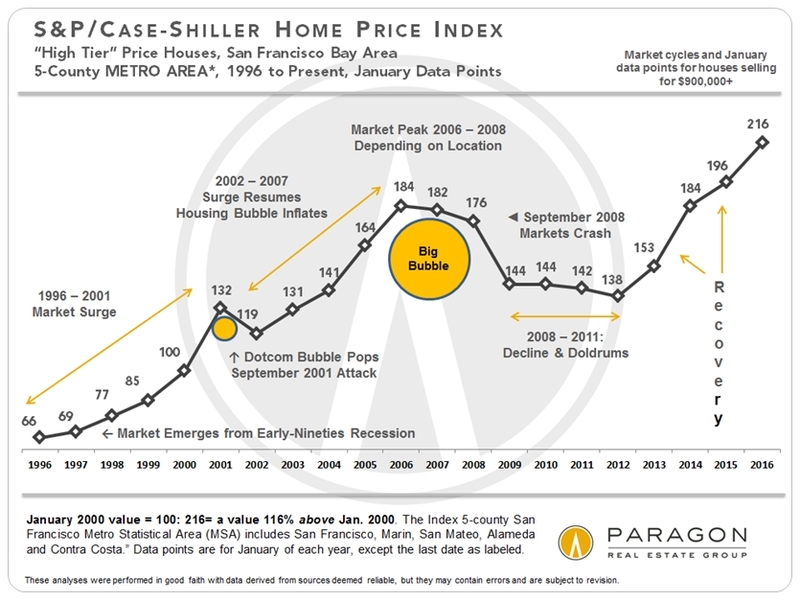 Smaller bubble (119% appreciation, 2000 – 2006) and crash (42% decline) than low-price tier. 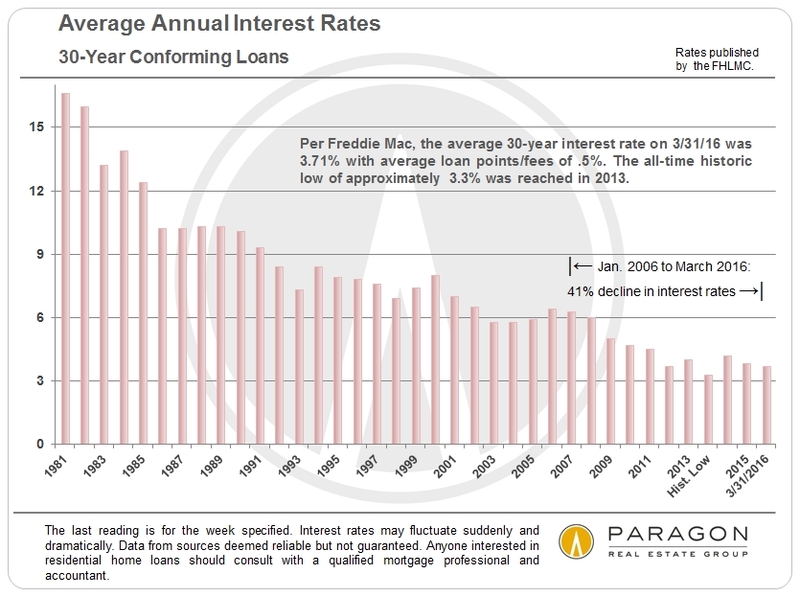 A strong recovery has put it back up to its previous 2006 peak. 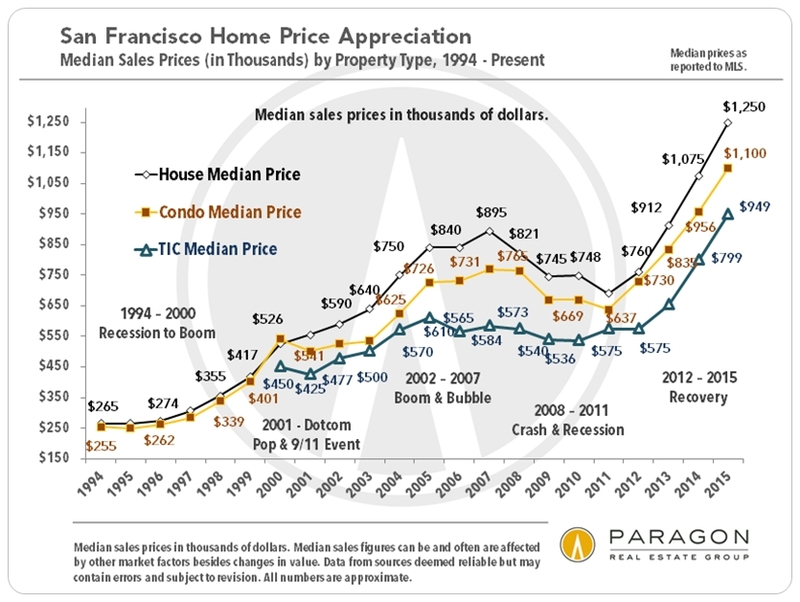 The more affluent neighborhoods led the city and the Bay Area out of recession in 2012, surging quickly, while the lower priced tier, still trying to recover from the huge distressed property/foreclosure crisis, lagged well behind. That dynamic shifted: the low-price tier caught up in 2013-2014, and lately it has been appreciating more quickly than the other segments.